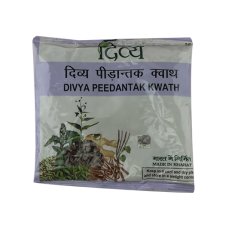 Peeplamul, Nirgundi, Ashwagandha, Rasna, Nagarmotha, Arendmul, Aaunth, Nagkesar, Gajpeepal besides night jasmine and carom seed (Bishop's weed), all anti-aeolian medicines, the kwath of which is helpful in joint pain, gout, sciatica and other similar problems. A mix of ancient formulae, with specific qualities. Tasty and effective kwath/decoction. 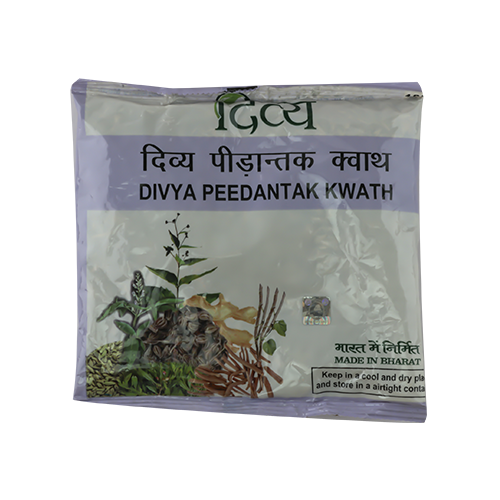 Mix 5-10 grams of kwath in around 400 ml water and boil it, till residue is 100 ml. Filter it and take empty stomach in the morning, one hour before dinner or before going to sleep. If the taste of any kwath is acerbic, then, if you are not diabetic, mix honey or any other sweet item. If you are unable to take this decoction in more quantity, boil for a longer period and with less water content, filter it. Be alert that honey shall be mixed, when decoction is cool and not hot.